Your kitchen remodel, or renovation is quickly coming to an end, and all you have left to do is decide on your finishes. This is a pretty big decision to make and can be even more difficult after you have already spent all that brain power making all the other vital decisions throughout the renovation process. Don’t worry. We are here to break it down for you and make these final few decisions a bit easier to handle. Countertops are one of the most significant decisions to make during the renovation process and choosing the right finish is essential to the finished product. Everything from the color of the countertop to its texture should be taken into consideration. Choose smooth and reflective materials that are durable and will fit in with your plans for the design for the rest of the space. Make as big or little of a statement as you wish as long as it is practical for you and is in line with your tastes and preferences. Another finish to the kitchen is the cabinetry. Some people base the entire space around the cabinetry while others use their countertops as their jumping off point. When choosing cabinetry, make sure to keep it clean and simple. Light colored cabinetry can make a space seem brighter and larger while darker cabinetry can offer some depth. Finally, you will add a few finishing touches to the kitchen to pull everything together. Contrast is always good in design. For example, if you chose darker countertops, then it would be wise to go with a lighter colored backsplash to beautifully contrast the darker colors. If you have chosen a countertop that is full of different colors and textures, then you may want to opt for a more muted look for the cabinetry and backsplash to keep the focus on the beautiful countertops. Another aspect of the finished product you will not want to overlook is the flooring. 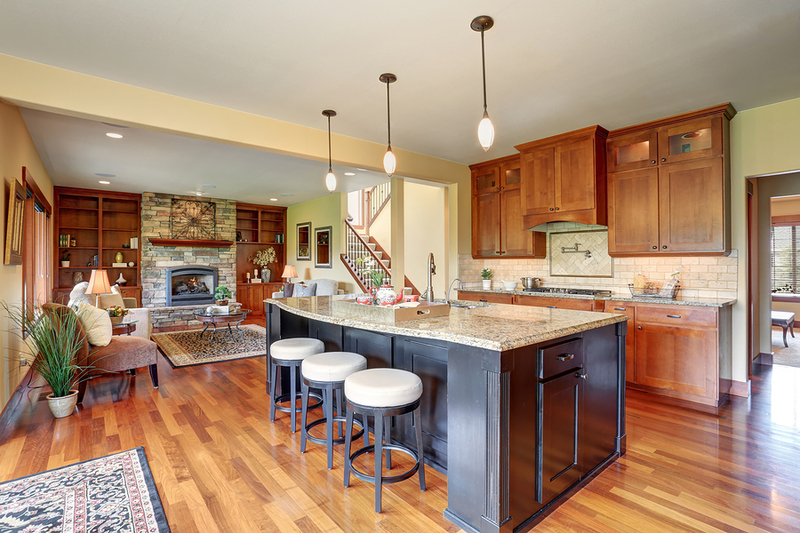 The flooring is meant to blend in with the rest of the home—and this is especially true of an open floor plan—but you will still want to make sure that the choices you make for the finishes don’t clash with the flooring that is already in place. Have more design questions or concerns? Contact us at Cardigan to go over a few of your finishing options.